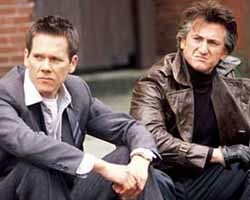 Mystic River is original, insightful, emotional, and something I never want to sit through again. River is a moody and dismal picture about childhood friendships and crime in a present day Irish neighborhood of Boston. 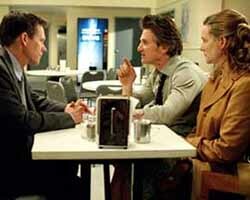 Laid out in what on the surface seems to be traditional crime drama structuring, the film focuses on three former friends, Jimmy (Sean Penn), Sean (Kevin Bacon), and Dave (Tim Robbins), who grew apart after entering adulthood. Jimmy is an ex-con who runs the local convenience store. He's protective of his a wife and daughters, particularly his 19 year old Katie, just coming into her own. Sean is homicide detective whose wife left him, taking with her Sean's unborn daughter whose name he doesn't even know. Dave is a handyman, frequently unemployed. He married and has a son, but remains unstable and damaged after an incident in their childhood when he was kidnapped and held prisoner by a child molester right in front of Jimmy and Sean, an event that haunts them all. 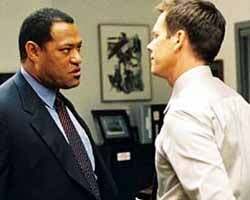 When Katie is brutally murdered, Sean and his partner Whitey (Laurence Fishburne) are called in to investigate the horrific crime scene. The three former friends are thus reunited amidst sadness and later suspicion as Dave becomes a prime suspect. His growing instability leads even his wife (Marcia Gay Harden) to mistrust him as he grapples with the horrific events of his boyhood. But Mystic River isn't really a crime drama. Rather, it's an inescapable spiral of pain and suffering into which three fantastic veteran actors pour their soulful performance best. It's more than a question of who did it. It is about guilt and mistake and agony resurfacing after decades of secretiveness. It is also very much about the loyalty of family and friends and how far worn out bonds can be tested. Penn in particular pours his heart out as a grieving and morally ambivalent father desperate to find relief for the guilt he personally feels over his daughter's murder. Unfortunately, Eastwood takes his character almost stylistically over the top by plastering Jimmy in very stunning, stylistic tattoos which while they look really cool, don't seem to fit in such a gritty drama about pain and guilt. In some ways, that could apply to everything in Mystic River, which comes off so highly stylized that it might feel better if someone strapped on a cape or started web-slinging instead of hanging out on the porch to have a good cry. What's more, Eastwood seems far too willing to throw in a curve ball at all the wrong times. For example, things repeatedly grind to a screeching halt with River's persistent attempts to define a failing relationship between Sean and his wife. Estranged but not divorced, she calls him regularly but does not speak. When we see her, it is only through her lips struggling to find a voice next to her receiver. I realize the idea might have been to use this as a means to bring more depth to the life of Sean. Yet, he grows more as a person through his interaction with his partner and his friends than he ever does through these rather glaring and ill-fitting interruptions into an otherwise tightly constructed character progression. Even the movie's pseudo-ending seems marginally out of the blue, with the relationship between Jimmy and his wife suddenly set up as some sort of unhealthy crime syndicate. Ultimately though what sticks with you about Mystic River isn't these things, but the depression and hopelessness inherent to the lives you've just spent a couple of hours watching. This isn't a movie that finds joy in anything, but rather dwells in a bleak realm of eternal misery and character ambiguity. 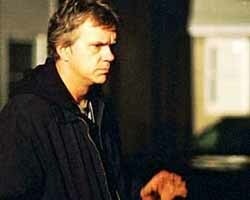 Mystic River is a good movie, but one so entrenched in anguish that you'll leave feeling empty and unhappy. It takes real talent to elicit that kind of emotional response from your audience, but it is also hard to recommend a movie that makes you so gloomy you're likely to walk out trying to forget it. I for one hope to avoid repeat viewings.